Infill Tool Kit Abuse - What Took So Long? The Bellingham version of a bail-out is the Type VI rezone process which allows developers to ask for a rezone on their property. Couple this process with the infamous Infill Tool Kit and you have a recipe for disaster in a neighborhood. (Read the InfillTool Kit ordinance by clicking here) You no doubt remember the sham “academy” put together by Tim Stewart, our former Planning Director, to gain enough faux citizen involvement in creating the Tool Kit to claim that it underwent a “public process”. Shortly thereafter, Stewart, having ladled the Infill Tool Kit turd into the zoning punchbowl, skulked off to Mercer Island, leaving the citizens here to drink from the contaminated tureen. There were those of us who fought the Tool Kit and thought that the city accepted that this device, although approved by the city council, was not to be used in single family zoned neighborhoods. “Yes, yes, three bags full” was the response, “Only for use in urban villages and the city center – multi-family zoned areas.” Unfortunately, one need go no farther than the present Sunnyland Neighborhood opposition to the rezone of the former DOT site to find an early prime example of the attempted misuse of the Tool Kit to provide for the financial well being of a developer at the expense of the desires of the people who actually live there. 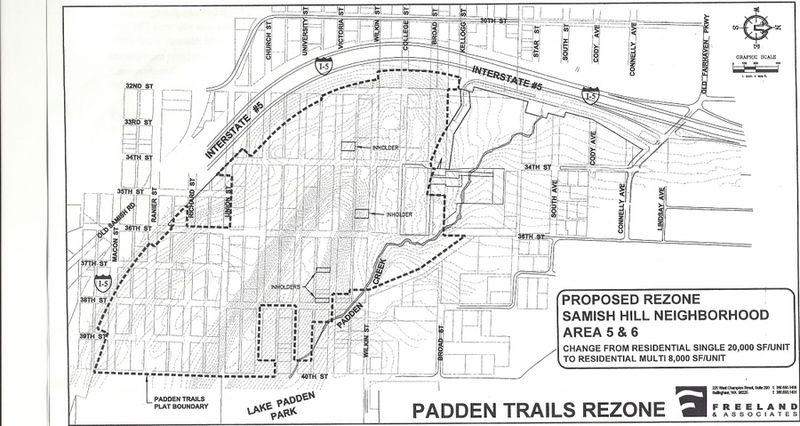 So late in 2010 the owners of the 113 acres in the Samish Neighborhood known as Padden Trails filed for a rezone of their property from single family residential to multi-family residential. The land, located east of I-5 and south of Connelly at the very edge of the city limits, is characterized by steep slopes and wetlands. It was zoned in 1969 to accommodate about 246 single family homes, although this zoning to half-acre lots was apparently done by folks who would not know a contour interval on the map, if it them in the face. Be that as it may, since the terrain will not readily allow such use, the developers have sought to rezone the property and have used as justification, in part, the infamous Infill Tool Kit ordinance. In essence, these developers are attempting to make a silk purse from their sow’s ear purchase by asking the city to bail them out and ignoring the desires of the Samish Neighborhood and the realities of the inappropriateness (dare I say quasi-legality) of placing dense zoning in the form 292 single family homes (i.e., Infill Tool Kit types such as cottages and townhomes) plus 200 multi-family units, for instance condominiums. “This is an extremely poor planning effort. Just try to reconcile the Staff report, the zoning application and the supporting documents, including an Amended SEPA checklist. The final application is for 615 housing units, while the supporting documents are for 492 units. Why was a SEPA determination and Staff report drafted for units that do not correspond to the application? The City references site plans and building schematics that were submitted in support of the application, but then admits that the site plan and schematics contain inadequate information for a substantive review, and have not been reviewed for feasibility or consistency with City Code. Given the relatively lower cost of these units, one might reasonably imagine reversion to rentals and the kind of degradation seen already in the Magnolia Hills development where investors swooped in after the initial cohort of owner-occupiers sold their homes (on small lots) and moved out or up. The area nowadays is a rental horror show, full of cars, trucks, boats, RVs and all such similar objects that seem to be prized in this city as lawn ornaments. Given the total lack of parking restrictions, the roads within Magnolia Hills can barely accommodate a single lane of traffic. Need we recreate that within Padden Hills? 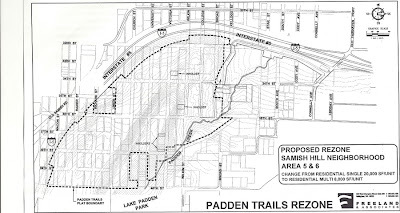 All of the above observations are but a few examples regarding not only the inadvisability of this particular Padden Trails rezone but also the distorted planning process and inherent disadvantage of neighborhoods attempting to resist the monied interests during Type VI rezones. The developers can count on money, staff, attorneys, other paladins and their associated mountebanks whose normal paid workday is that of schmoozing city officials and preparing myriad documentation and slick promotional material at which altar the Planning Department appears to worship. The neighborhoods depend on unpaid effort and time with little or no financing except for voluntary contributions from those who already have jobs, families and related obligations. The city aids and abets this obvious imbalance. You should be worried, for this could be a show coming to your neighborhood soon. The Planning Commission will meet to consider this rezone application on Thursday, December 1st at 7:00pm. Click here for more information.